Police have tonight closed the M55 between junctions one and three after a multi-vehicle accident caused by 'freak snowfall'. The county's gritters have been out in force this evening, but the crash on the motorway between the M6 interchange at Preston and junction four at the A583 has seen the motorway closed completely just before 11pm. 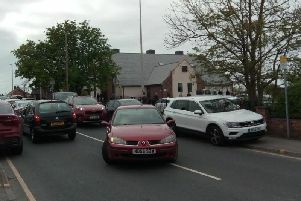 AA Roadwatch said the road was "closed due to multi-vehicle accident on M55 Eastbound in Lancashire. Due to freak snowfall causing multiple accidents police have closed the road. Westbound is also shut." Highways England said: "The M55 is closed in both directions, J1 - J3, while our Traffic Officers work hard to assist the emergency services at the scene of an incident. Diversion routes are in place." They are telling people to stay inside their vehicles as trapped traffic is about to be released. And people were quick to respond to the incident on social media. Natalie O'neill, who said she was 'just shaken up' said on Facebook: "Awful incident about 20-30 car pile up from between Preston to Kirkham junction. "About 200 yards of sleet/snow was horrible to witness, nobody knew what was going on until we came to a stand still, unfortunately some of us couldn’t stop our cars in time which ended up in the pile up such a awful freak road accident." Colin Ackerley wrote: "It was so sudden a downfall, complete white out. I made it through but was nearly sideways at times as I slowed down, lots of cars were off the road, I hope the only damage was to cars and not people." Pete Tomlinson said on Twitter: "M55 closed in both directions tonight. We were caught up in the chaos but managed to manoeuvre through after some skid pan action! We pray everyone is not too badly hurt. At least 10 cars involved and bits of car parts over the road."